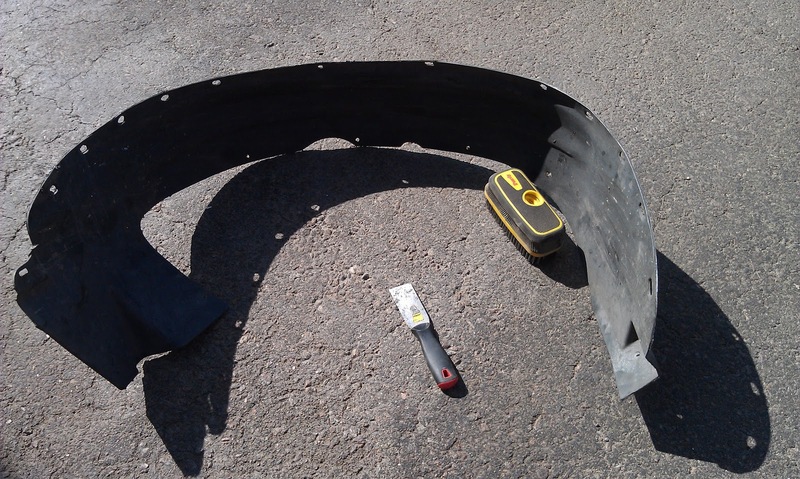 Here is the floor pan to be painted from the driver side looking back. 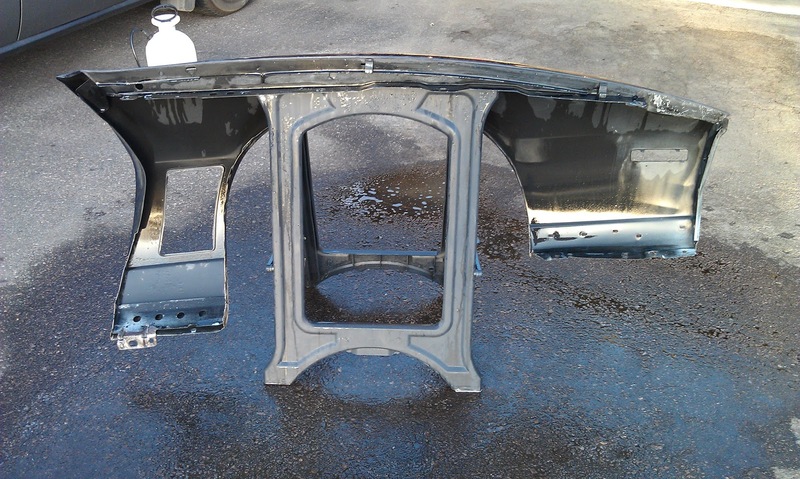 Here is the floor pan to be painted from the passenger side looking back. 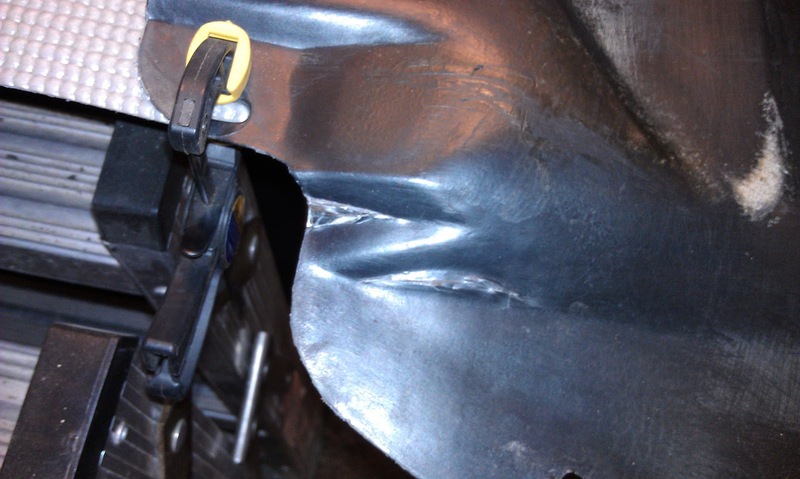 This is the fuel filler neck should I repaired with POR-Patch and PowerMesh. 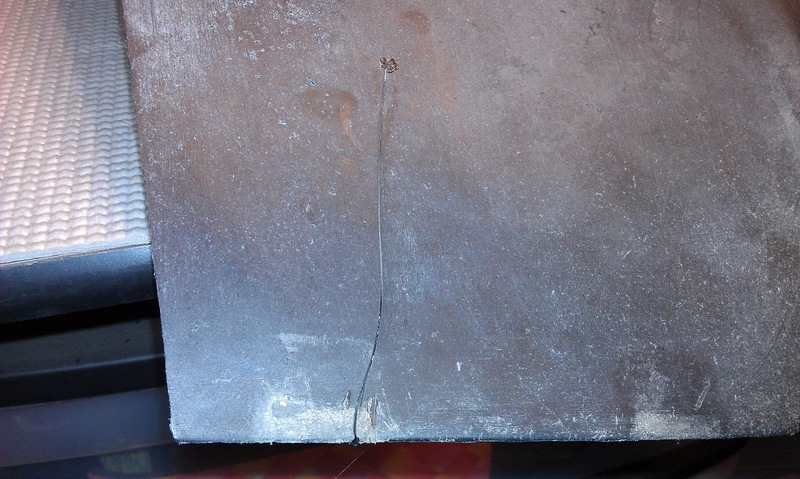 You can still see the crack from the front, but it is mended and solid. I used lacquer thinner and wiped down the entire outside of this piece. I only plan to paint the exposed side. 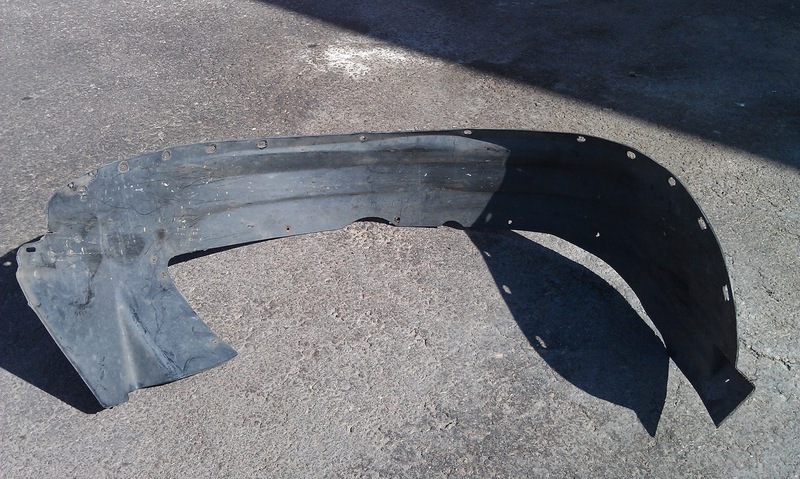 These are plastic so I do not have to worry about them rusting, so this is purely for appearance. Ready to apply the first coat of POR-15! 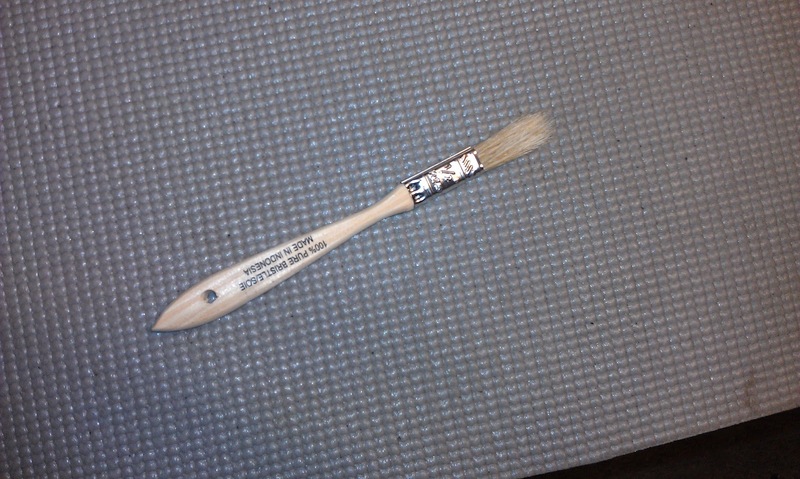 Sara found these smaller brushes at Menards last night. 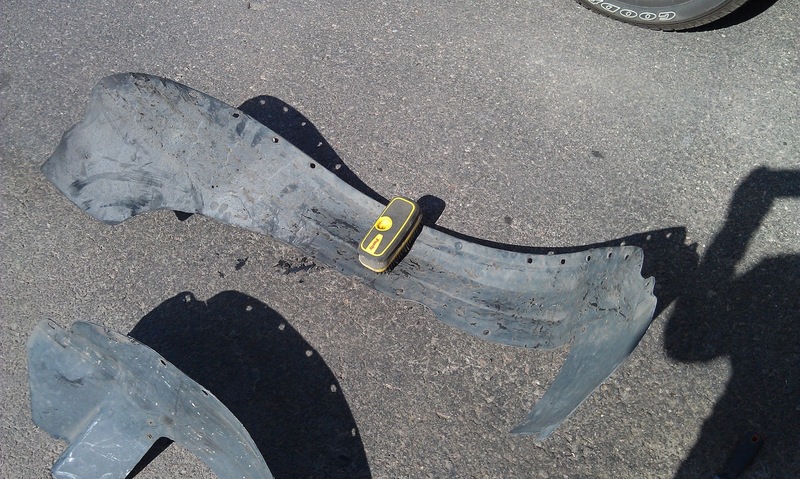 I plan to use them to get into some of the tight spots on the car. 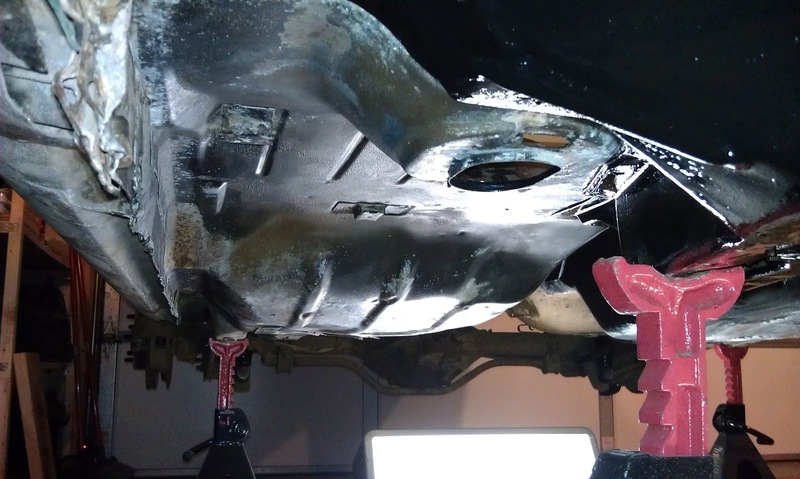 Driver side floor pan after first coat of POR-15, again looking towards the back. 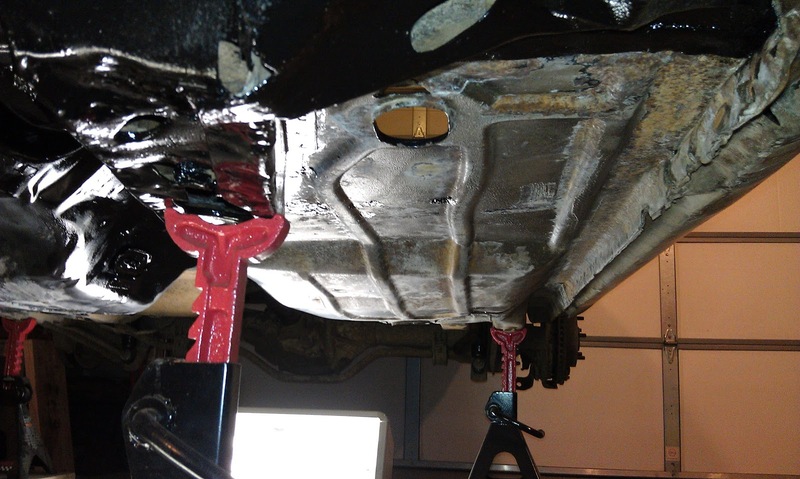 Floor pan looking from the driver side front wheel with one coat of POR-15. 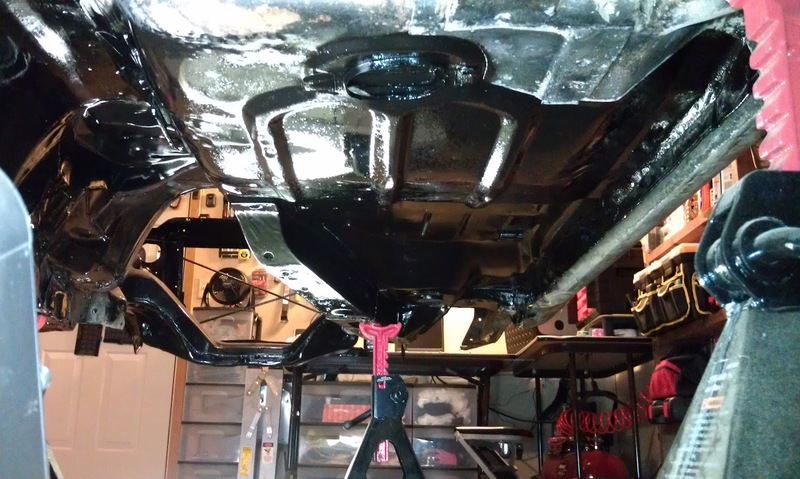 Passenger side floor pan after first coat of POR-15, again looking towards the back. 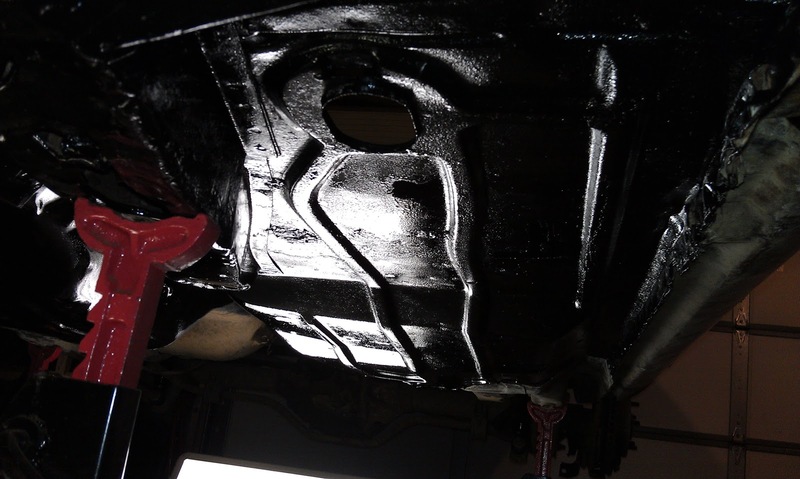 Driver side floor pan after first coat of POR-15 looking towards the front. 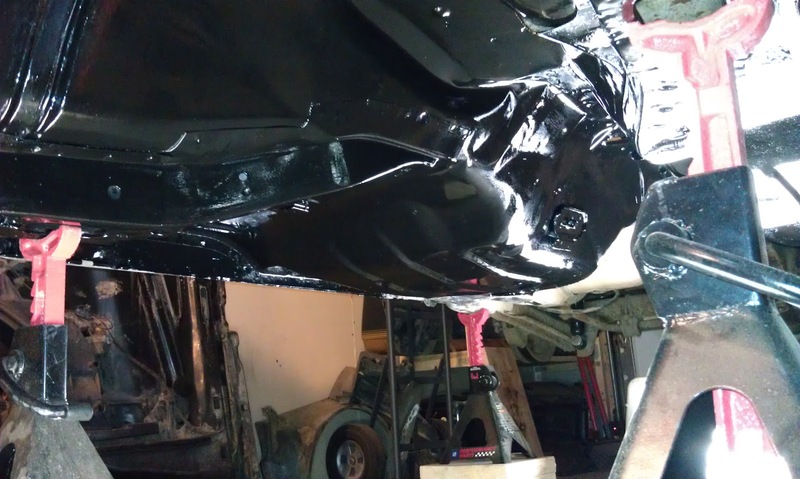 Passenger side floor pan after first coat of POR-15 looking towards the front. 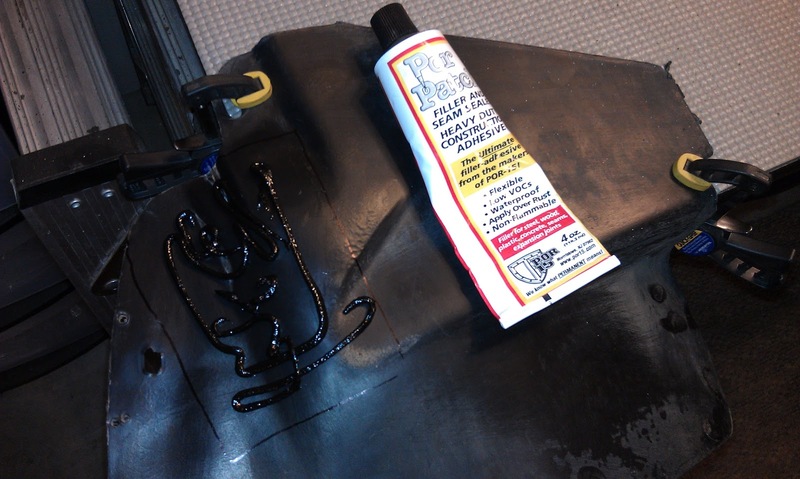 Fuel filler neck shroud with one coat of black POR-15. 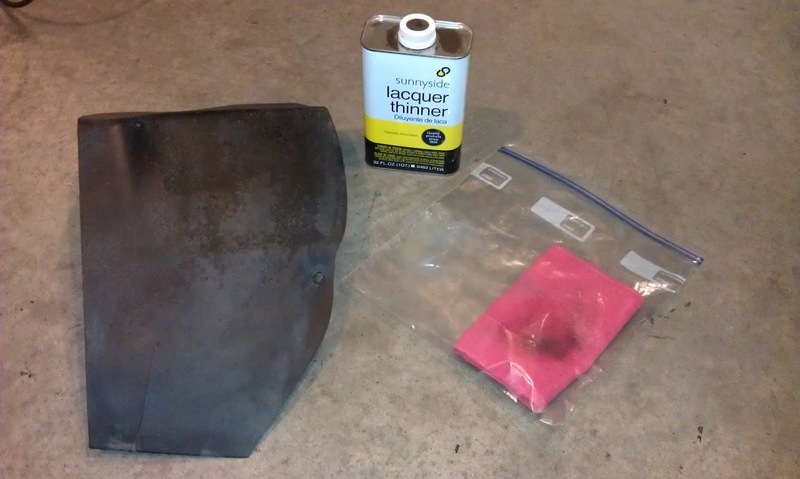 After the first coat of POR-15, I decided to work on cleaning up the fender well inserts I purchased. They are in good shape, but were covered with splatters of tar. 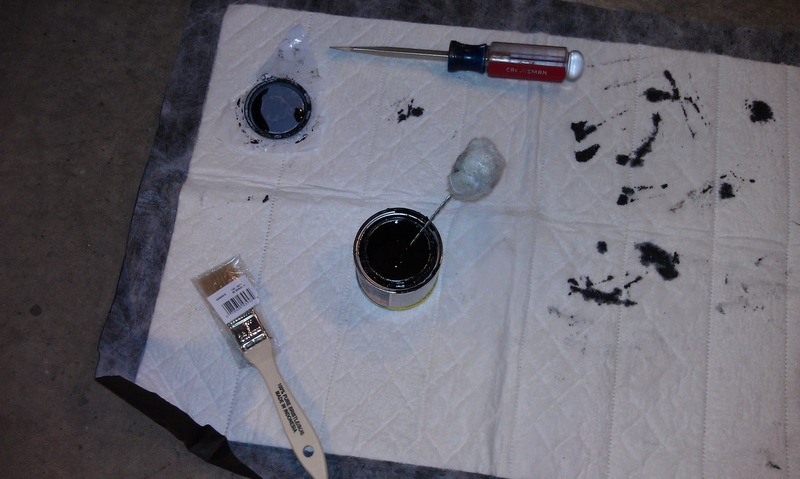 I used a combination of putty knife and wire brush to remove the tar. 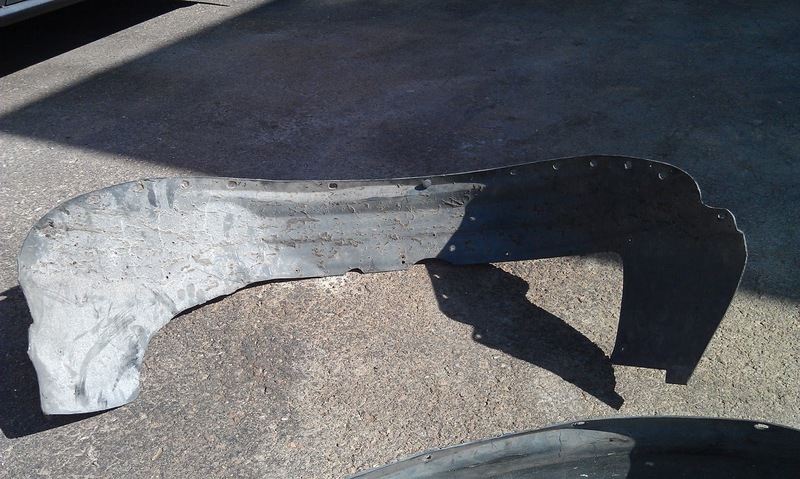 Driver side fender well insert before cleaning. 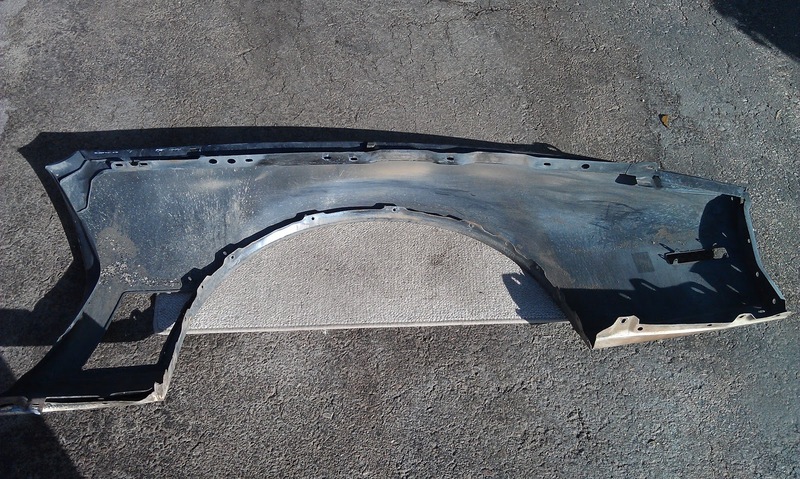 Passenger side fender well insert before cleaning. 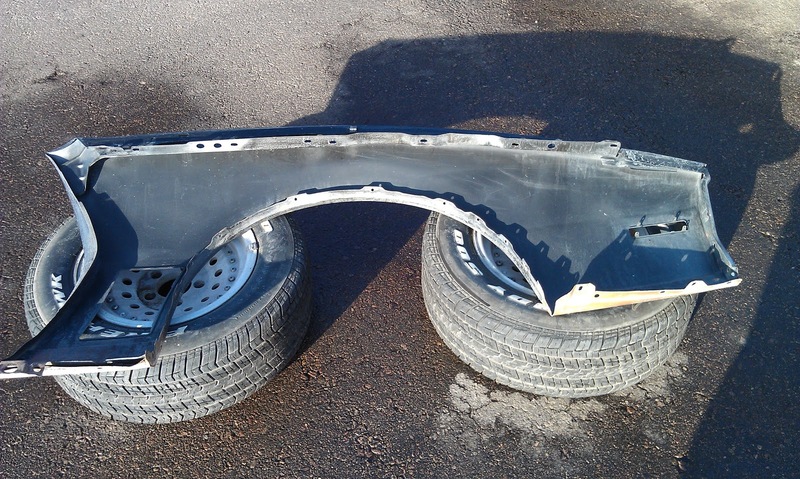 The passenger side fender well was much worse than the driver side. 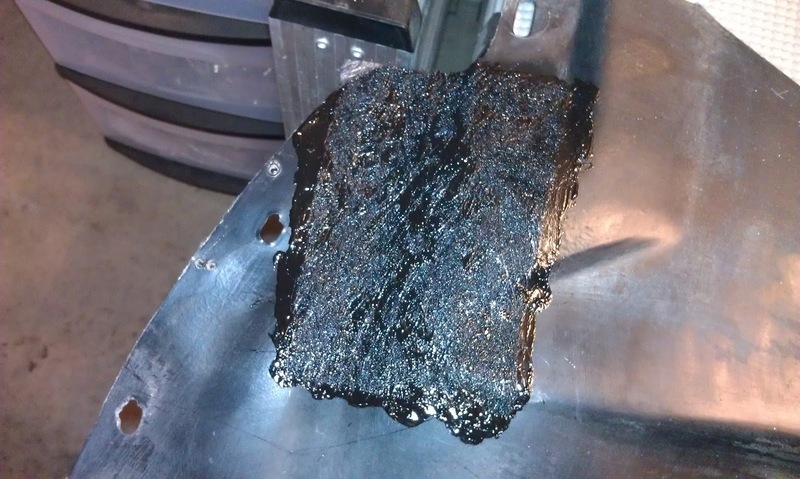 It was completely covered in tar. The black specks on the pavement just below the brush is actually tar that I scraped off. 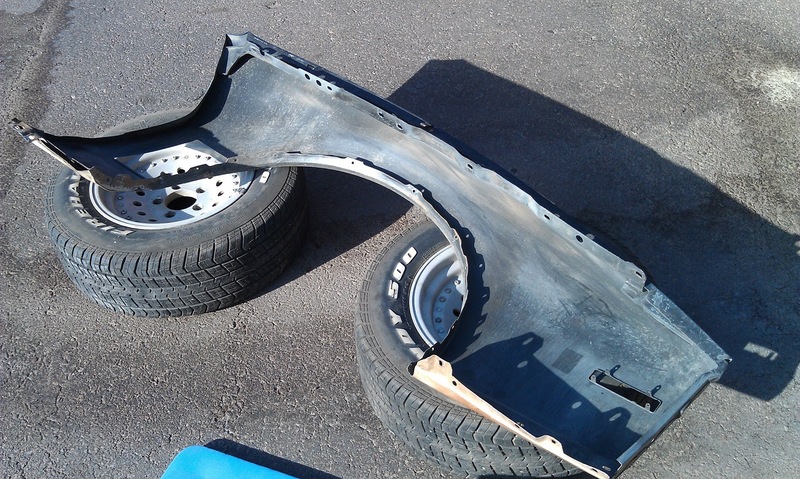 I figured out while working on the passenger side that the tar comes off much easier after the insert has sat in the sun for about 15 minutes. 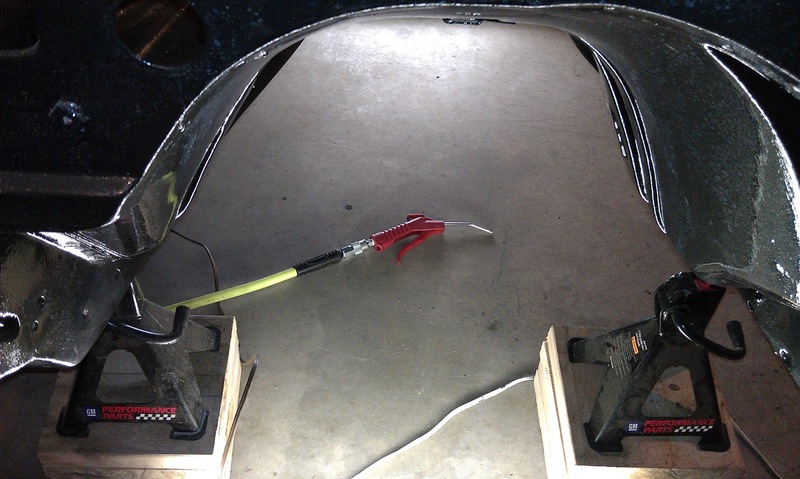 Once the inserts were dry, I pulled them back in the garage and proceeded to start repairs on the crack in the driver side insert. 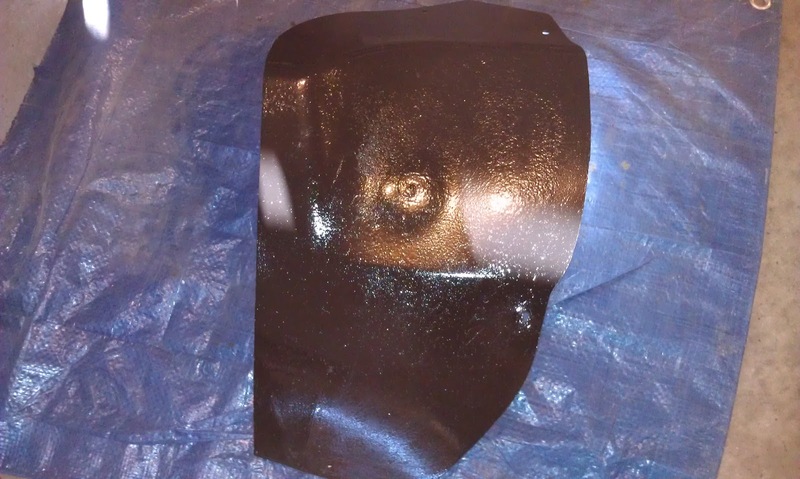 I used the same process I had success with on the fuel filler neck shroud. I used duct tape to cover the front of the crack and pushed the broken pieces from the back so they stuck to the duct tape. 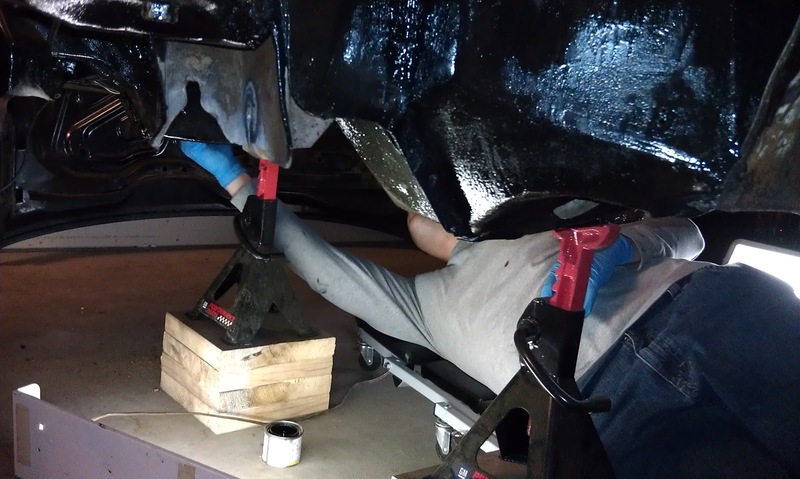 Then I flipped the insert over and clamped it down to the bench. Here is a picture of the area to be repaired. 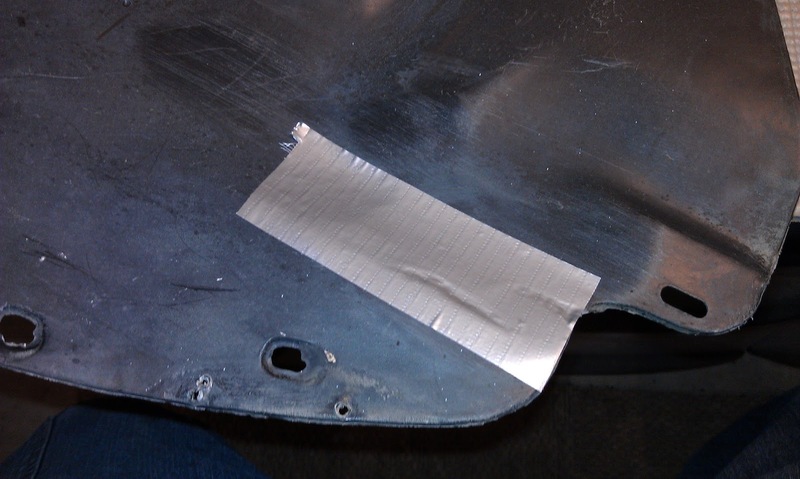 You can see how the weakened and cracked areas are laying flat and sticking to the duct tape on the front. 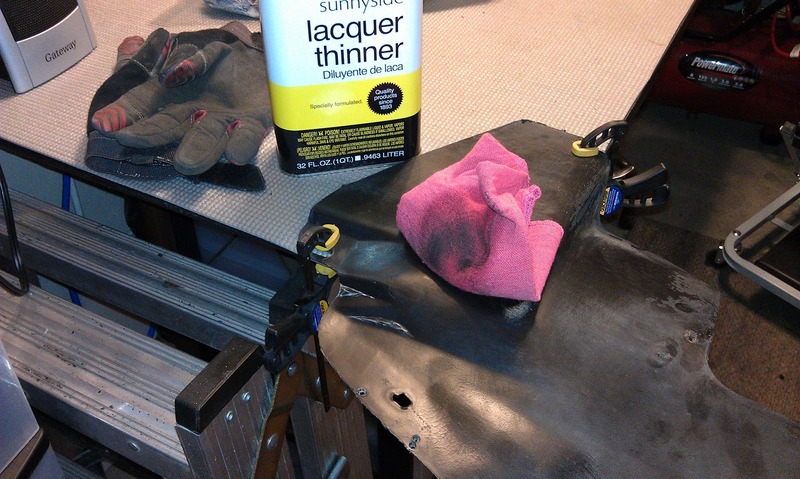 I wiped the repair area with lacquer thinner. This should help to promote adhesion. I cut out a PowerMesh patch, laid it in place and traced it with a black Sharpie. I covered the area liberally with POR-Patch and spread it out with a putty knife. 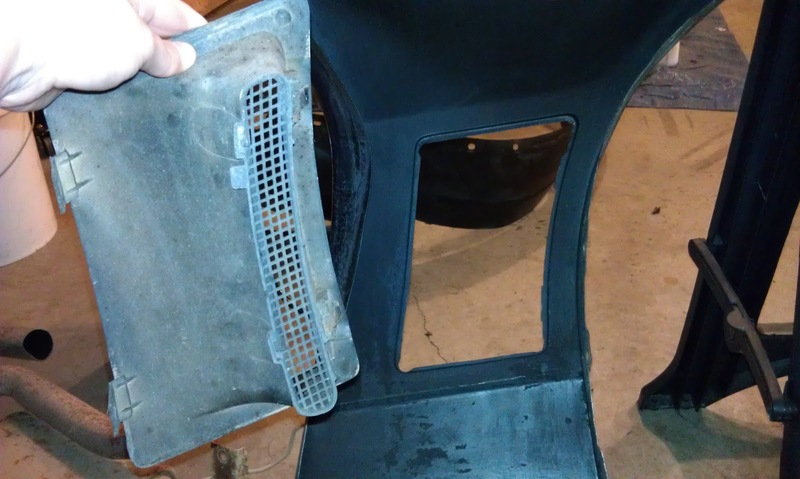 I pressed the PowerMesh into the POR-Patch until it was thoroughly saturated the removed one clamp so the insert could return to its natural shape. 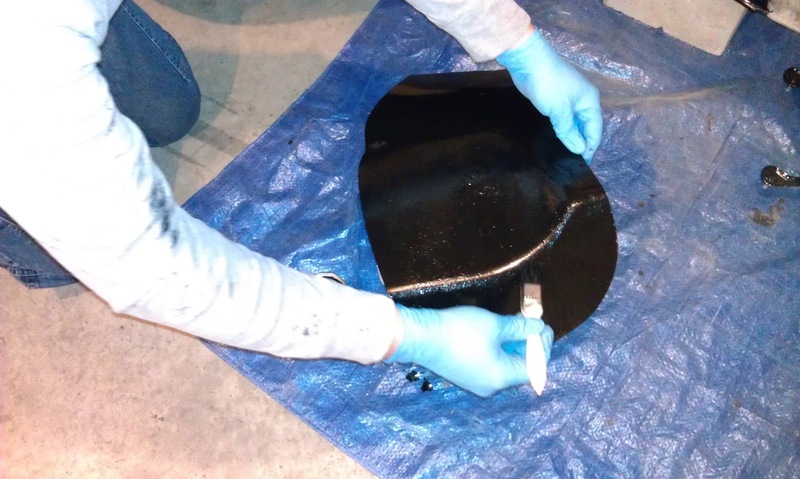 Sara's dad came over to help while I applied the second coat of POR-15 to the floor pans and shroud. 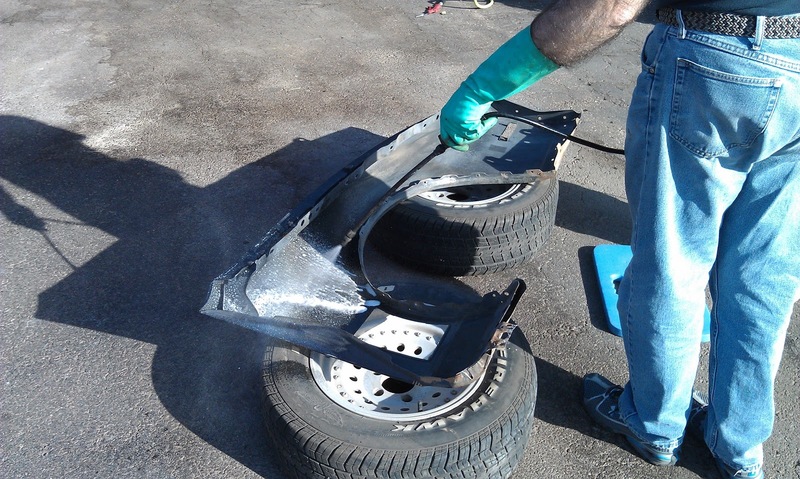 He worked on cleaning up the inside of the driver side fender with a wire brush. 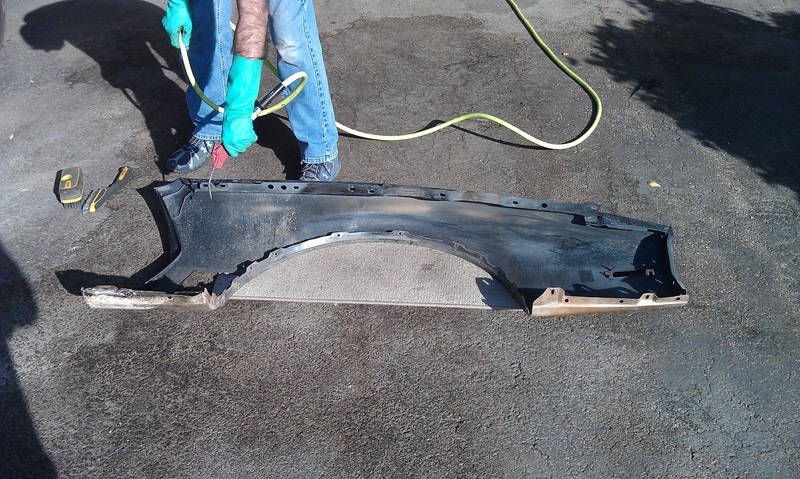 After he had thoroughly wire brushed the driver side fender, he took it outside to get it in the sunlight so he could see it better. (It's pretty dark in the garage, and like I said before, it was beautiful and sunny outside today.) He laid it on a rug to keep it off the asphalt. Then he used the air compressor to blow off all the dirt and dust he had brushed free. 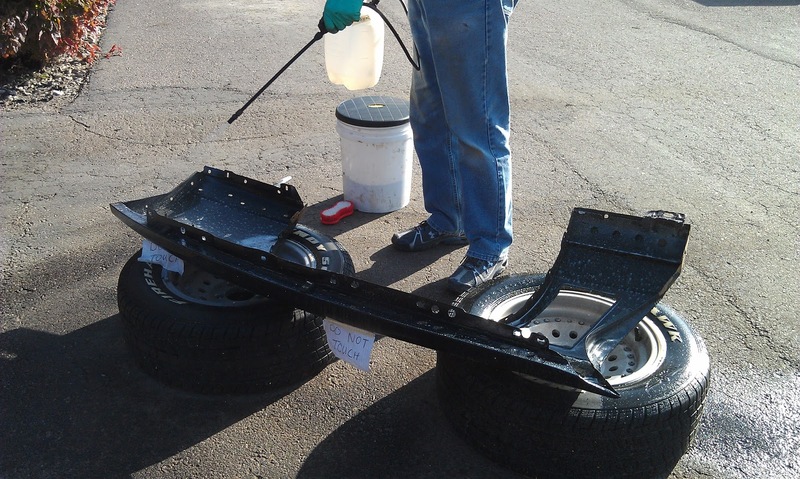 Here is a picture of Sara's dad applying MarineClean to the fender. 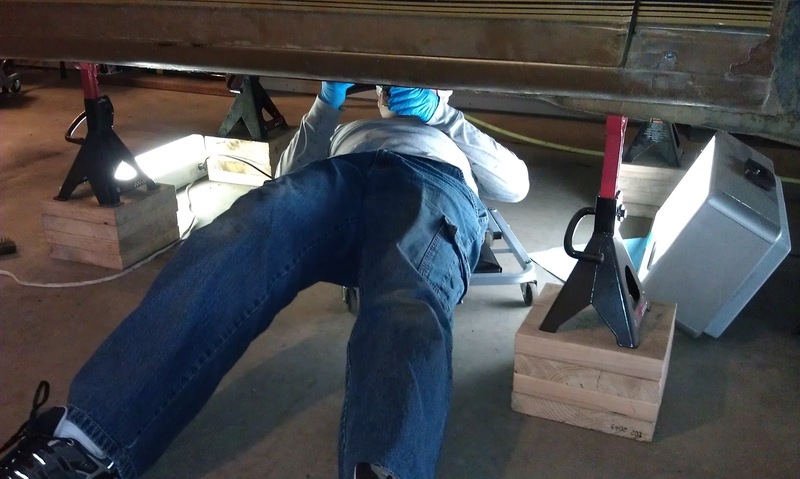 While he was doing that, I was applying the second coat of POR-15 to the floor pans. 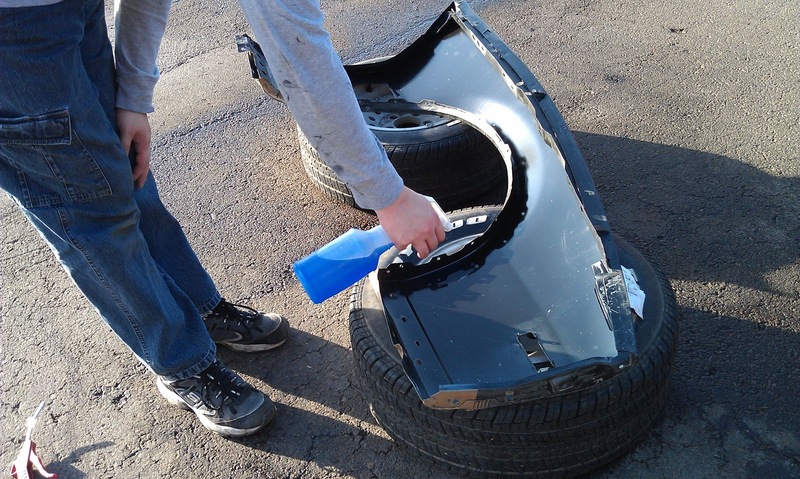 Applying a second coat of MarineClean to the driver side fender. 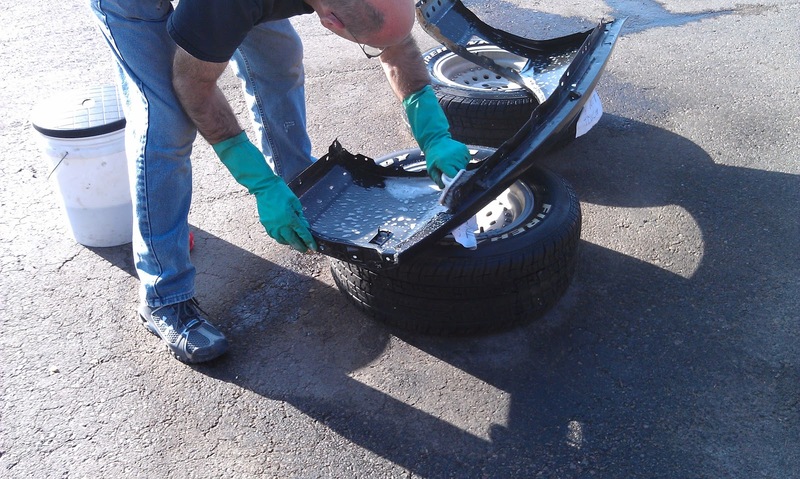 Here is a picture of Sara's dad cleaning the fender with a scrub brush. I had opened the garage door, but it was so windy we were getting a blizzard of dandelion seeds in the garage. Like a magnet, they stuck themselves all over the shroud I had painted. Luckily it was before I applied the second coat of POR-15. I was able to scrape most of them off before I applied the second coat. 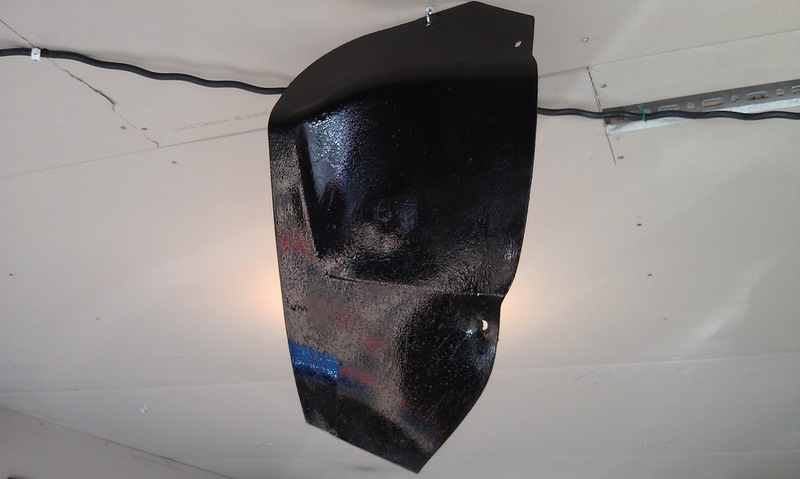 After the second coat of POR-15, I hung the fuel filler neck shroud from a hook in the ceiling. This allowed me to keep the garage door open and kept the dandelion seeds off of it. 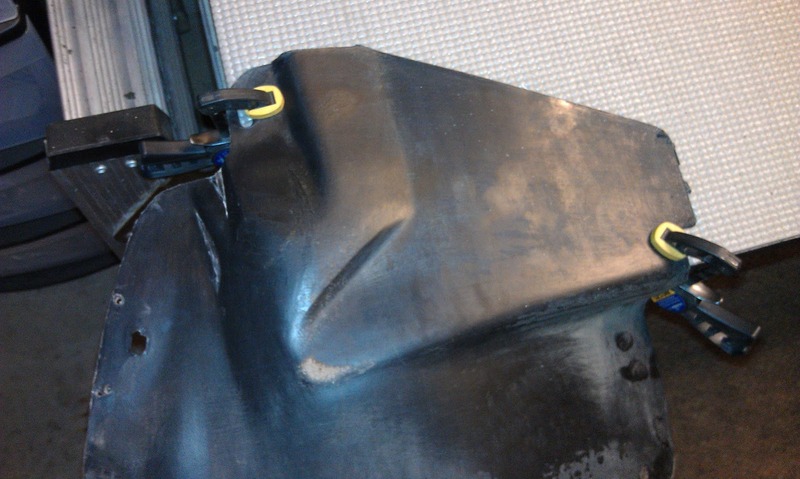 This is the driver side fender after being cleaned with MarineClean. 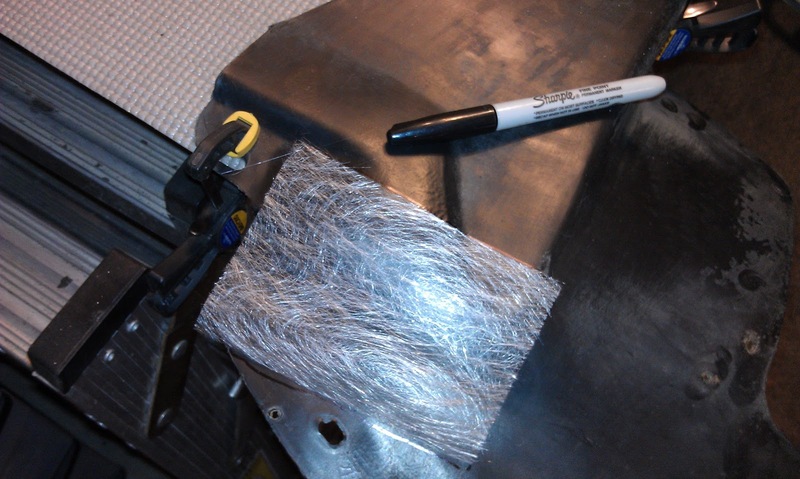 I applied Prep and Ready to the inside of the fender using the normal 30 minute process. 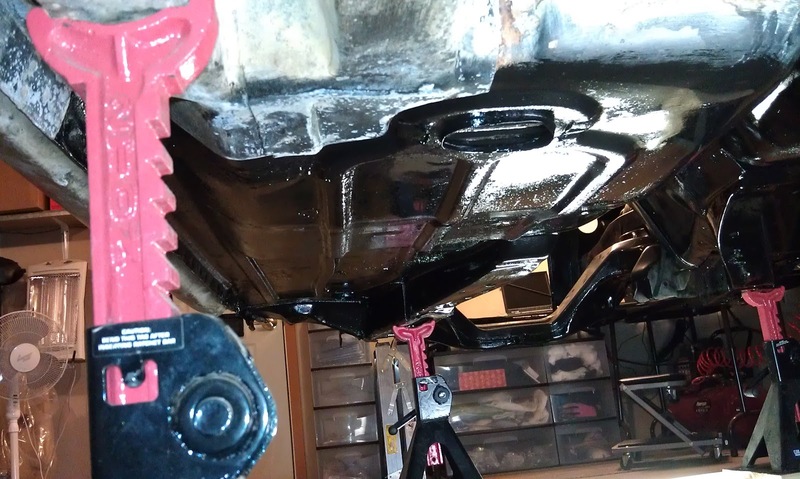 I hung the fender on a saw horse and rinsed off the Prep and Ready. 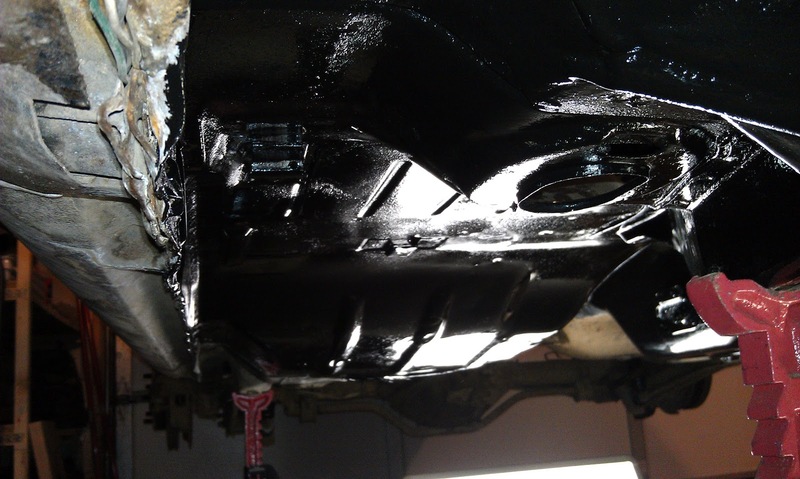 This allowed the fender to dry as it would naturally. Oh! I remembered something I did Friday! 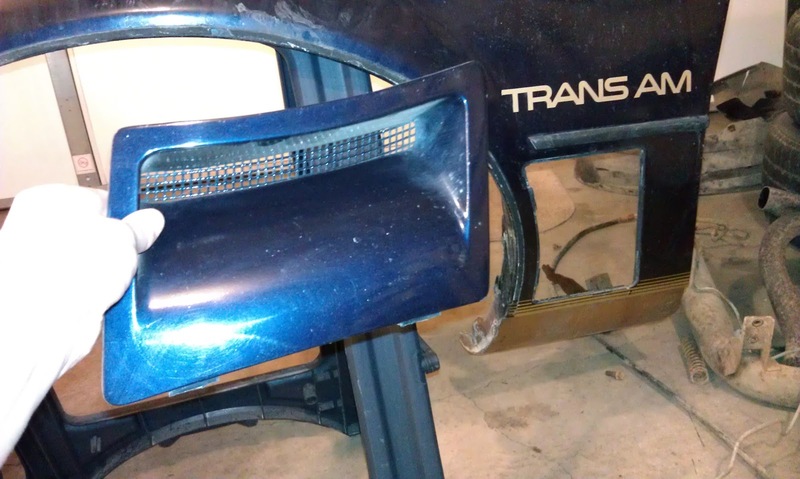 I removed the fender vent from the driver side fender. Here are pictures of the front and back. 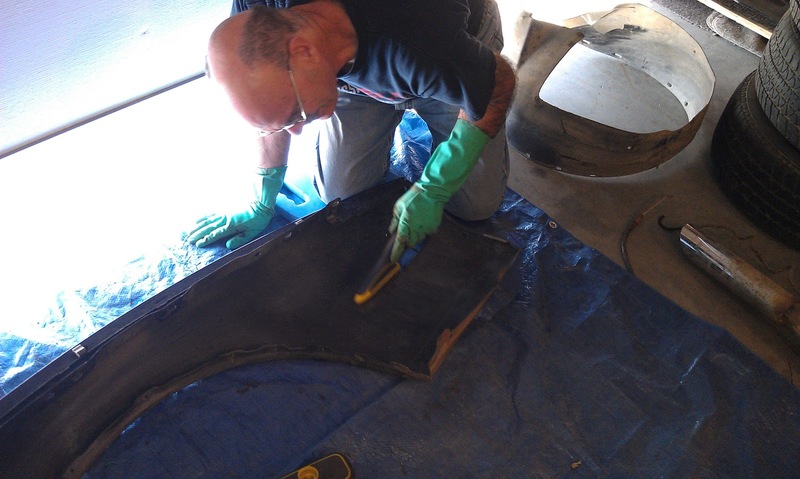 Here I am applying the third and final coat of POR-15 to the floor pans. 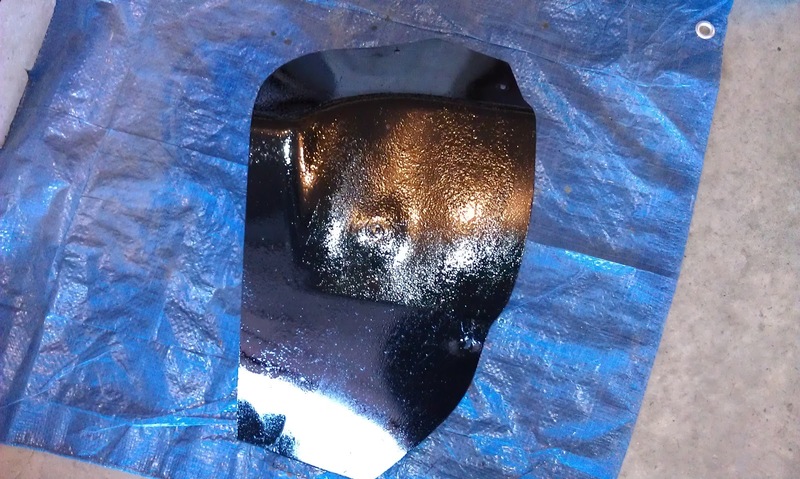 The fuel filler neck shroud got a third coat of POR-15 too.